Essential oils can be used to soothe, calm, inspire, energize and delight. They can be used in a variety of ways, including gently heating oils in water to release the fragrance, incorporating the oils into skin care products like soap, lotion, and massage oil and making aromatherapy candles with essential oils. Did you know that you can also add essential oils to foods as flavorings? Our food grade essential oils are safe to use to flavor your own tea blends, baked goods and to flavor whipped cream. Top notes are the lightest and most fleeting part of a perfume, providing the initial fragrance impression. Their initial appearance lasts but a few minutes, and then they blend with the middle notes when that phase of the perfume begins. Clary Sage: Lends a sweet, herbal undertone to citrus, floral and woodsy blends. Eucalyptus: Camphoraceous, herbal, invigorating. Steam distilled. Grapefruit: Fruity, cheering, smells like grapefruit peels. Cold pressed. Lemon: Fruity, uplifting, smells like lemon peels. Cold pressed. Lemon Eucalyptus: Citrusy, crisp, invigorating. Steam distilled. Organic Orange: Fruity, uplifting, smells like orange peels. Cold pressed. Sweet Orange: Fruity, uplifting, smells like orange peels. Cold pressed. Peppermint: Cool, fresh, vitalizing. Steam distilled. Tea Tree: Herbal, crisp, cleansing, purifying. Steam distilled. Middle notes define the character of the perfume, help classify its fragrance family and can modify its base notes to develop on the skin. They can last for hours, harmonizing with the supporting base notes. Lavender: Herbal, flowery, soothing. Middle to top note. Steam distilled. Lemongrass: Lemony, herbal, cleansing. Top to middle note. Steam distilled. Rosemary: Herbal, crisp, clarifying. Steam distilled. Base notes carry the top and middle notes, giving a perfume its depth. Base notes are often referred to as fixatives because they prolong the evaporation rate, also called dry down, and the life of a fragrance on the skin. Patchouli: Musky, warm, soothing. Steam distilled. Safety: Always dilute essential oils before use. 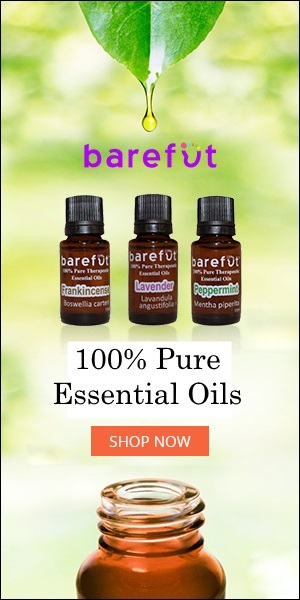 Certain essential oils should not be used by persons with certain medical conditions, or by pregnant women. If you are pregnant or have a medical condition, consult your physician before using essential oils. Call for information regarding country of origin.